The 'head cat-herder' of the online quilting group I'm with lost her husband recently. 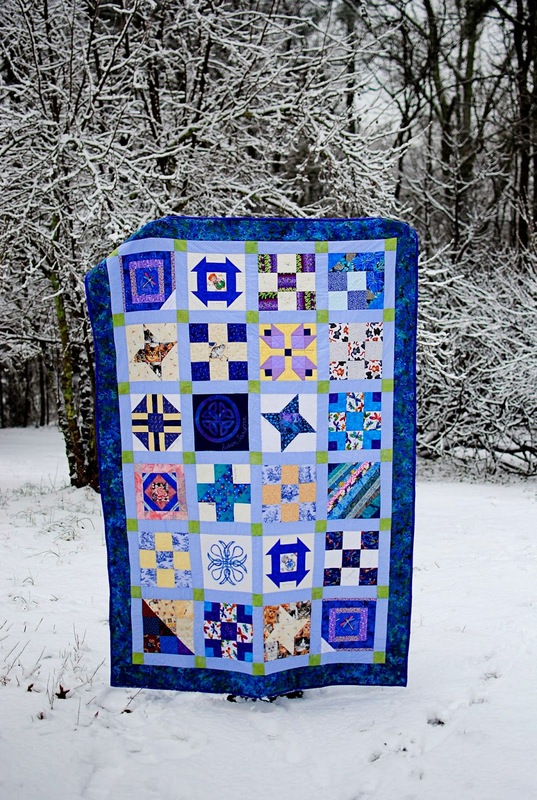 So what do quilters do when one of their own is hurting? We make a quilt! Quilters from all over the world contributed to this quilt. Each block is signed and lovingly made to send some comfort to our friend. Some folks who declared themselves 'sewing impaired' contributed funds to help cover the cost of backing fabric, batting & postage. Dondy S in PA collected all the blocks and assembled them, and then sent the top to me to quilt. I focused on each block as a unique section of the quilt, and freemotion quilted them based on whatever would enhance and showcase the individual block. In addition to 'stitching in the ditch' around each block, there are a lot of hearts, dragonflies, spirals and swirls quilted in this quilt. Thanks to some ice & snow day, I had plenty of 'down time' to work on it. The morning after I finished it, a lovely blanket of snow was covering our yard...which made for a lovely backdrop. The quilt was mailed yesterday, and should be delivered by Monday. I sincerely hope that Valerie receives as much love out of the quilt, that was put into the quilt.